Is it possible to safely switch off cylinders while simultaneously transmitting field data and set up the system in accordance with standards? Yes! In order to rule out a safety-critical fault between adjacent printed circuit board tracks/contact points (short circuit) according to DIN EN ISO 13849, clearance and creepage distances must be considered. One way to eliminate faults is to provide galvanic isolation by not interconnecting safety-relevant circuits/segments. This means charge carriers from one segment cannot switch over to the other, and the separation makes it possible to connect the safety world with automation — with IO-Link. Safely switching off actuators and simultaneously collecting sensor signals reliably via IO-Link is possible with just one module. To further benefit from IO-Link and ensure safety at the same time, Balluff’s I/O module is galvanically isolated with a sensor and an actuator segment. The two circuits of the segments are not interconnected, and the actuator segment can be safely switched off without affecting the sensors. Important sensor data can still be monitoring and communicated. 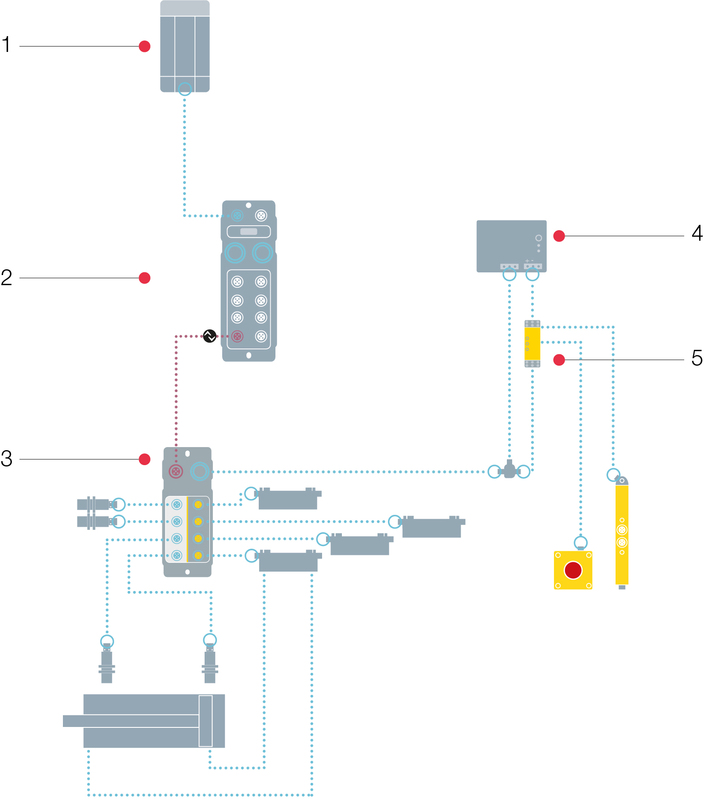 A PLC is connected to an IO-Link master module via a fieldbus system. The IO-Link master is the interface to all I/O modules (IO-Link sensor/actuator hubs) or other devices, such as IO-Link sensors. The IO-Link communication takes place via a standardized M12 connector. Binary switching elements can be connected to the galvanically isolated sensor/actuator hub (BNI IOL-355). The four connection ports on the left correspond to the sensor segment and the four ports on the right correspond to the actuator segment. Communication of the states is done via IO-Link. The power supply for both segments takes place via a 7/8″ connection, whereby attention must be paid to potential separated routing of the sensor and actuator circuits. Both the power supply unit itself and the wiring to the IO-Link device with the two segments must also ensure external galvanic isolation. This is made possible by separating the lines with a splitter. An external safety device is required to safely interrupt the supply voltage of the actuator segment (four ports simultaneously). Thus, the module can implement safety functions up to SIL2 according to EN62061/PLd and ISO 13849. For example, this can happen through the use of a safety relay, whereby the power supply is safely disconnected after actuation of peripheral safety devices (such as emergency stops and door switches). At the same time, the sensor segment remains active and can provide important information from the field devices. The module can handle up to eight digital inputs and outputs. If the IO-Link connection is interrupted, the outputs assume predefined states that are retained until the IO-Link connection is restored. Once the connection is restored, this unique state of the machine can be used to continue production directly without a reference run. An application example for the interaction of sensors and actuators in a safety environment is the pneumatic clamping device of a workpiece holder. The position feedback of the cylinders is collected by the sensor segment, while at the same time the actuator segment can be switched off safely via its separately switchable safety circuit. If the sensor side is not required for application-related reasons, galvanically isolated IO-Link modules are also available with only actuator segments (BNI IOL 252/256). An isolated shutdown can protect up to two safety areas separately. Matthias Wolfer has experience and knowledge of the industrial automation industry with Balluff. With his product and industry knowledge, he is sharing his passion for automation with Automation Insights.